The Catholic Church in Oradour, is known simply as, Eglise d,Oradour-sur-Glane (The church of Oradour-sur-Glane), for unlike in the UK and most English speaking countries it is not usual for parish churches to be named after saints, instead they are simply referred to as, 'The church of xxxxx'. After the fire, French rescue workers found an almost undamaged statue of Saint Bernadette (of Lourds) in the ruins and this is now housed in the Catholic Church of the new village. 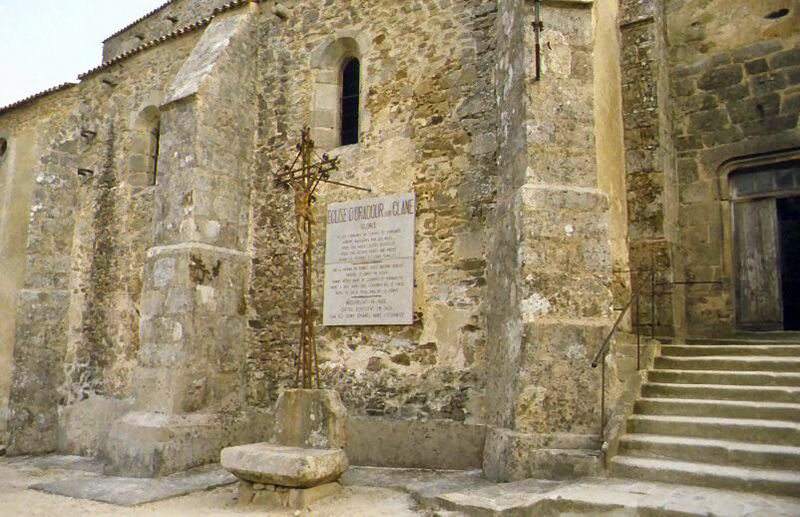 The original church is built out of granite and dates from the 15th century. The steeple was a later addition from the 16th century. It was through the doorway on the right that all the women and children entered the church on 10th June 1944. The plaque behind the Cross reads: Silence. The hundreds of women and children here were massacred by the Nazis. You that pass collect yourselves and who that believe make a prayer for the victims and their families. In the town remaining in lonely ruins outside the Cross of Christ. Bernadette our Lady of Lourdes. Come to me you that suffer says the Christ, do that he tells you says the Virgin. Requiescat in pace. That they rest in peace. Because they are living in eternity.